I am not sure why but I have found in some series that the second book will lag. I will end up reading just so I can get to the next book. I am so happy to report that HEAT OF THE MOMENT is not such a book. If anything, this book is better then the first book. I tend to be drawn to any book about animals and one where the heroine can actually talk to them. I am so there. I love the character of Becca. She is just that tad different and not quite sure why she doesn't fit with the rest of the family but she is really happy with her choice of profession. She had grown up with Owen and fallen in love with him before he up and left. She's never gotten over his departure though neither has he. They run back into each other at the scene of animal sacrifices. I found that I enjoyed this book much more then the first. It's not any longer but Becca and Owen have a history which helps to explain the swiftness at which their relationship develops. There was some great dialogue, instances of male pride, sexual chemistry and danger. What more could a reader desire? 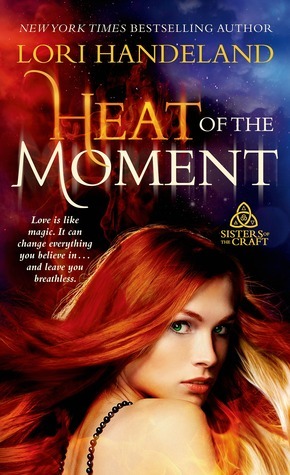 I do recommend this book to any of my readers who enjoy paranormal romance. It's a quick read and now is the perfect time to pick up all three so you can just go from one book to another..